Are you prepared for this Hurricane Season? 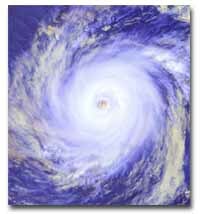 Weather forecasts by the Weather Channel or NOAA forecasts for 2006 demand individual hurricane preparedness survival for a minimum of two weeks. Emergency preparedness requires use of safe designs for hurricane kits and/or emergency kits that can be used indoors without the risk of explosion or toxic fumes. Stoves designed for emergency use are better suited than conventional b-b-q or camping stoves. Sterno, butane, propane and Coleman stoves using white gas or kerosene are not recommended for indoor use. Candles and candle fuel cells used in hurricane lanterns and candle lamps can be safe when attended properly and have significantly lower environmental impact than batteries. Commercial candle lamps offer extended operating times much longer than the short life of expensive, wasteful batteries. Natural fuel sources such as canned heat and candles are lower cost and make less impact on the environment. Products such as EcoFuel, EcoFuelXB, HeatCell and Lumatane candles offer spill proof and spill resistant designs with low emissions safe for indoor cooking or outdoor cooking. FEMA suggests generators for maintaining refrigeration however, most generators are undersized for whole house applications. Gasoline and diesel is difficult to obtain when service stations fail to operate. creates a unique combustion at the top of the can and eliminates spills. Keeps food hotter longer with no danger of alcohol gel fires, and more heat than wicks. Safer, easier to use, cost effective. combines the heat of a gel with the burn time of a wick into an advanced proprietary fiber technology known as Encapcellon™ Technology! The significant features EcoFuelXB's Encapcellon™ Technology are high-performance, long-burning heat derived from specialized fibers that encapsulate and concentrate the fuel combustion at the top of the can for the full burn time. This unique spill—proof combustion process enables the flame to remain at a consistent distance to the bottom of the cooking surface generating consistent, safe heat. 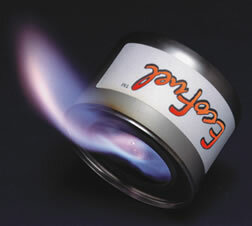 EcoFuel XB has a wider plume than wicks and does not burn down into the can like gels. It offers the longest cooking time (up to 5 hours) and longest warming time (up to 10 hours) with the double opening lid. Eco—nomical; One can of EcoFuel XB is equal to 4 cans of one time use gel! EcoFuel XB is spill proof; should the can fall face down, it safely extinguishes, greatly reducing the risk of fires and burns. The odorless, clean burn eliminates carbon build up and offers the lowest Co emissions available. Eco-logical; Made from 100% biodegradable/inert materials, EcoFuel XB is easy to relight for multiple uses until the fuel is completely consumed making it the choice for "Green” consumers. EcoFuel XB’s unlimited shelf life is ideal for emergency use because it does not evaporate or go bad. Ideal for camping, tailgating, fondues, boating, fishing, backpacking, emergency relief or catering ...the uses are unlimited.